The item "AT154162 JOHN DEERE ROTARY MANIFOLD SEAL KIT. 490E 792ELC 892ELC" is in sale since Monday, July 30, 2018. This item is in the category "Business & Industrial\Heavy Equipment, Parts & Attachments\Heavy Equipment Parts & Accessories\Antique & Vintage Equipment Parts". 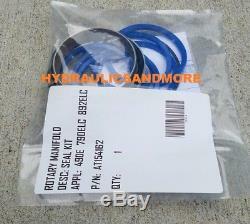 The seller is "hydraulicsandmore" and is located in NORTHEAST USA. This item can be shipped worldwide.